NBA’s Derek Fisher Has an “Obsessed” Stalker In Real Life. The #1 movie in theaters this past weekend was Obsessed, starring Idris Elba as Derek Charles, Beyonce as Derek’s wife Sharon, and Ali Larter as Derek’s stalker Lisa. In a nutshell…..the story starts with Lisa showing up at Derek’s office and wiggling her way into the position of his assistant. There’s a party, she’s gets a little touchy-feely, he rejects her, and she goes crazy. Lisa builds a whole relationship between her and Derek in her head and will stop at nothing to get him for good. The movie is pretend, but the story is completely plausible, as I found out on TMZ today. It’s just a coincidence that the following story came out today, but it’s so close to the movie’s plot line, it’s eerie. And the fact that the leading man in both stories is named Derek is just down right freaky. NBA star Derek Fisher, a point guard for the Los Angeles Lakers, got a judge to issue an order of protection against a woman who’s been harassing him and his family for a long time — and the danger is escalating. We’ve learned the woman is a stranger who may have mental issues. She claims to be in an ongoing relationship with him for years. She started showing up at his home, scaring his wife and kids. She changed her last name to Fisher … Her first name is Symone. Fisher says Symone has been harassing him for years. They have no relationship of any kind. She believes they are either married, or parenting children together — she’s claimed both. She has said she felt God wanted them to be married. This has been going on for a long time — We found that Derek applied for a restraining order against Symone back in 2005 but it was dismissed because he didn’t follow through in court. 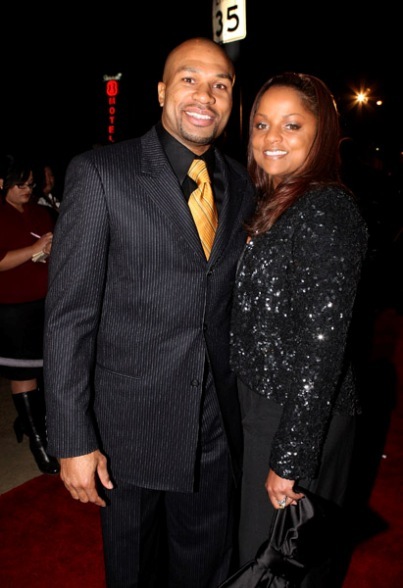 Derek and his actual for real wife, Candace…..